Reading and share top 32 famous quotes and sayings about Belief And Unbelief by famous authors and people. Browse top 32 famous quotes and sayings about Belief And Unbelief by most favorite authors. 1. "Lament is a cry of belief in a good God, a God who has His ear to our hearts, a God who transfigures the ugly into beauty. Complaint is the bitter howl of unbelief in any benevolent God in this moment, a distrust in the love-beat of the Father's heart." 2. "A belief in God helps provide a foundation to arbitrate our decisions. Without this foundation, we are condemned to live essentially formless lives." 3. "Your core beliefs are the central part of your internal belief system." 4. "A writer never forgets the first time he accepted a few coins or a word of praise in exchange for a story. He will never forget the sweet poison of vanity in his blood and the belief that, if he succeeds in not letting anyone discover his lack of talent, the dream of literature will provide him with a roof over his head, a hot meal at the end of the day, and what he covets the most: his name printed on a miserable piece of paper that surely will outlive him. A writer is condemned to remember that moment, because from then on he is doomed and his soul has a price." 5. "There is, especially in the American media, a deep belief that insincerity is better than no sincerity at all." 6. "He who asserts belief with absolute certainty knows nothing of faith and makes himself into a fool. He who is wise, upon realizing they have done this, recants and searches themselves for further enlightenment." 7. "Do not all theists insist that there can be no morality, no justice, honesty or fidelity without the belief in a Divine Power? Based upon fear and hope, such morality has always been a vile product, imbued partly with self-righteousness, partly with hypocrisy. As to truth, justice, and fidelity, who have been their brave exponents and daring proclaimers? Nearly always the godless ones: the Atheists; they lived, fought, and died for them. They knew that justice, truth, and fidelity are not conditioned in heaven, but that they are related to and interwoven with the tremendous changes going on in the social and material life of the human race; not fixed and eternal, but fluctuating, even as life itself." 8. "Drive,determination,and belief are important to build your success but dont ever miss one very important thing is the ATTITUDE." 9. "Greatness is a transitory experience. It is never consistent. It depends in part upon the myth-making imagination of humankind. The person who experiences greatness must have a feeling for the myth he is in. He must reflect what is projected upon him. And he must have a strong sense of the sardonic. This is what uncouples him from belief in his own pretensions. The sardonic is all that permits him to move within himself. Without this quality, even occasional greatness will destroy a man." 10. "With most men, unbelief in one thing springs from blind belief in another." 11. "When we get to the end of human beings we have to delude ourselves into a belief in God, like a gourmet who demands more complex sauces with his food." 12. 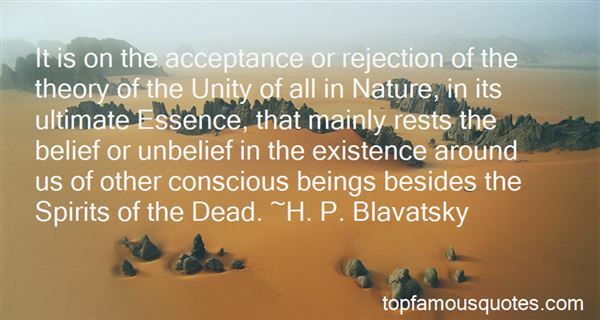 "It is on the acceptance or rejection of the theory of the Unity of all in Nature, in its ultimate Essence, that mainly rests the belief or unbelief in the existence around us of other conscious beings besides the Spirits of the Dead." 13. "The central belief of every moron is that he is the victim of a mysterious conspiracy against his common rights and true deserts." 14. "They were the reason that he kept faith with his stars, that reinforced him in his belief that the universe had more in store for him than the mug's game of working for a modest salary until he retired or died,"
15. "Simon had the child's belief that the rest of the world exists as staging for their personal drama; destiny hung over him, casting clues and signs in his path, and he could not help feeling that ha had been vouchsafed a sign, a celestial wink." 16. "My family was Jehovah's Witnesses, which is a really tough religion. It kind of deterred me from religion for a long time. They still practice, but I don't. But I always remained spiritual, and had a belief that there is a God. I'm trying to find my way, you know?" 17. "Do not just believe in God and neglect the fact that He has an unprecedented belief in you." 18. "First we must understand that all of the world's deceptions flow from the belief that love is primarily for the fulfillment and comfort of the self. The world poisons love by focusing first and foremost on meeting one's own needs.Christ taught that love is not for the fulfillment of the self but for the Glory of God and the food of others. True love is selfless. It gives; it sacrifices; it dies to its own needs." 19. "Once, the belief that his love would heal all the wounds, and finally make me feel safe, had been true. True, and a lie. Love is real, and false, even true love. Because love alone cannot keep you safe, if there is still a trembling fear inside you. Still a knowledge of what it was like to love and believe and have it all taken away." 20. "Now that science has helped us to overcome the awe of the unknown in nature, we are the slaves of social pressures of our own making. When called upon to act independently, we cry for patterns, systems, and authorities. If by enlightenment and intellectual progress we mean the freeing of man from superstitious belief in evil forces, in demons and fairies, in blind fate--in short, the emancipation from fear--then denunciation of what is currently called reason is the greatest service reason can render." 21. "Women want everything of a lover. And too often I would sink below the surface. So armies disappear under sand. And there was her fear of her husband, her belief in her honour, my old desire for self-sufficiency, my disappearances, her suspicions of me, my disbelief that she loved me. The paranoia and claustrophobia of hidden love." 22. "We only see what we want to see; we only hear what we want to hear. Our belief system is just like a mirror that only shows us what we believe." 23. "If you've got a religious belief that withers in the face of observations of the natural world, you ought to rethink your beliefs - rethinking the world isn't an option." 24. 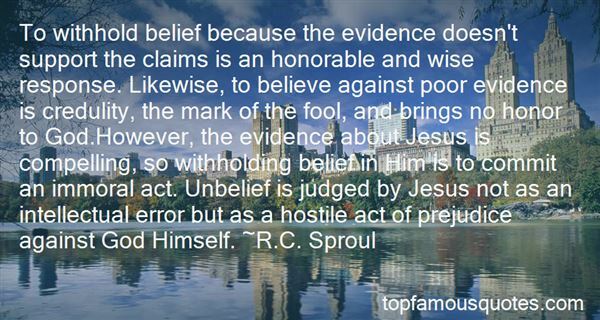 "To withhold belief because the evidence doesn't support the claims is an honorable and wise response. Likewise, to believe against poor evidence is credulity, the mark of the fool, and brings no honor to God.However, the evidence about Jesus is compelling, so withholding belief in Him is to commit an immoral act. Unbelief is judged by Jesus not as an intellectual error but as a hostile act of prejudice against God Himself." 25. "The decisions we take reflects our belief and our charachter"
26. "You always give credit where credit is due - to high school coaches, college coaches - but my dad, the foundation that he built with me, is where all of this came from. The speed, the determination, the mindset, just the natural belief that you can do anything you put your mind to, it all comes from my dad." 27. "I loved his enormous aptitude for compassion, adoration and respect. That was his way of showing love. He lacked the capacity for wickedness, and that caressed my belief that he might just be an angel. My angel." 28. "A wish becomes a greatest desire at the very moment when a person's belief in the seemingly impossible is stronger than any doubt.-Kevin McNamara"
29. "It is not belief to say God exists and then continue sinning and hoarding your wealth while innocent people die of starvation. When belief does not control your most important decisions, it is not belief in the underlying reality, it is belief in the usefulness of believing." 30. "Nobody takes democracy or justice seriously, we are all aware of theircorrupted nature, but we participate in them, we display our belief inthem, because we assume that they work even if we do not believe inthem"
31. "What do you think will be more effective when it comes to succeeding, believing you can or KNOWING you will? Let today be the last day you took timid steps of belief and start taking confident steps of purpose-driven knowing!" 32. 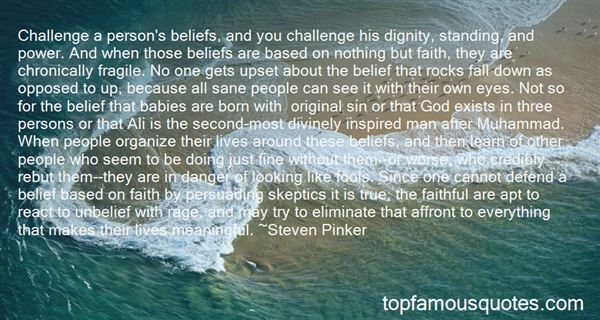 "Challenge a person's beliefs, and you challenge his dignity, standing, and power. And when those beliefs are based on nothing but faith, they are chronically fragile. No one gets upset about the belief that rocks fall down as opposed to up, because all sane people can see it with their own eyes. Not so for the belief that babies are born with original sin or that God exists in three persons or that Ali is the second-most divinely inspired man after Muhammad. When people organize their lives around these beliefs, and then learn of other people who seem to be doing just fine without them--or worse, who credibly rebut them--they are in danger of looking like fools. Since one cannot defend a belief based on faith by persuading skeptics it is true, the faithful are apt to react to unbelief with rage, and may try to eliminate that affront to everything that makes their lives meaningful." How did you even know I wasn't in my room? ""I checked on you." Finn gave me a look like I was an idiot. "I check on you every morning. ""You check on me when I'm sleeping?" I gaped at him. "Every morning? "He nodded. "I didn't know that. ""Why would you know that? You're sleeping," Finn pointed out."